Born (1961) and raised in Michigan artist Pablo Dominguez began drawing around age 4. As a muchacho (Spanish for “youth”), many hours were spent exploring and working outdoors while visiting relatives in a rural area of Mexico with no electricity or running water, but plenty of ranch animals. The Christian artist summarizes his respect for the natural world by stating “I am continually amazed at the beauty, design, and purpose that almighty God has placed into his creation of nature and wildlife. And I don’t say that in a whimsical or trite manner, but rather from an undersanding that the design, complexity, and order we see in all life points to a common designer rather than a common ancestor”. Pablo’s travels across the United States include visits to areas such as Yellowstone National park, South Dakota’s Badlands, Audubon State Park, and the Great Smoky Mountains. His trips to wildlife refuge areas and large and small zoos also allow him many hours of observation and study of wildlife and landscape. 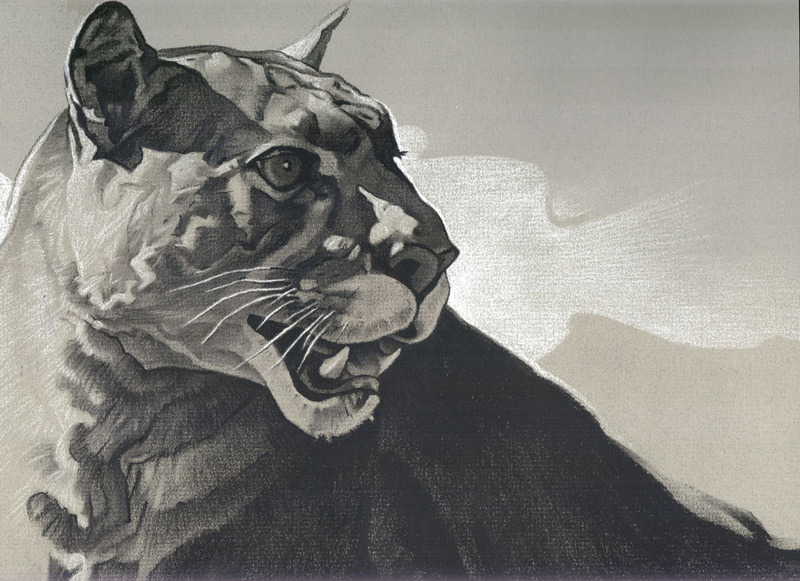 Pablo’s artwork has appeared in Wildlife Art magazine and he is co-author of an instructional art book on painting wildlife in acrylics for Walter Foster Publications. The year 2005 saw his work accepted into the exhibit “Art of the Animal Kingdom X” in Bennington, Vermont, and the following year his painting titled “Brown Bear Brow” won the Henderson Breakfast Lions Club award, one of the top prizes given at the Kentucky National Willdife Art Exhibit. The artist and his wife Charlene share their home with their black lab and several cats, occasionally doing foster care work for a local animal rescue. To learn more about Pablo, please follow this link to visit his Website. Presented here is a DRAWING demo. The story so far: I am working upright on an easel. The DRAWING surface is a sheet of tinted charcoal paper taped to a sturdy board with a thick sheet of paper sandwiched between the two (to provide some cushion). 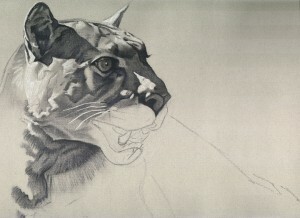 Several sticks of compressed charcoal (from 2-4 inches long), a white pastel stick, Paper stumps, a single edge razor, and a kneadable eraser are the tools. 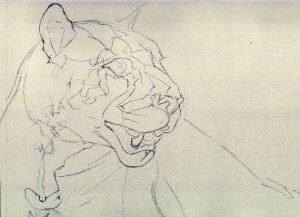 The image here has been laid out, but I feel the proportion is off on the length of the cougar’s nose/muzzle, I feel it’s bridge is too long. In the past I may have let it be, but investing hours in a DRAWING that is based on faulty proportion is not a happy feeling once the piece is completed and the mistake is more evident. 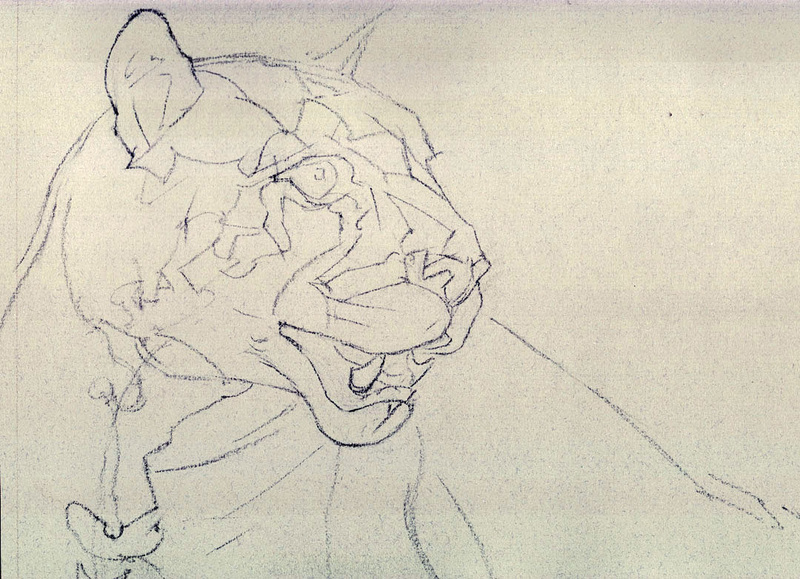 The nose/muzzle has been re-drawn to the proper size befitting of a cougar. This line drawning essentially lays out landmark spots I have selected. 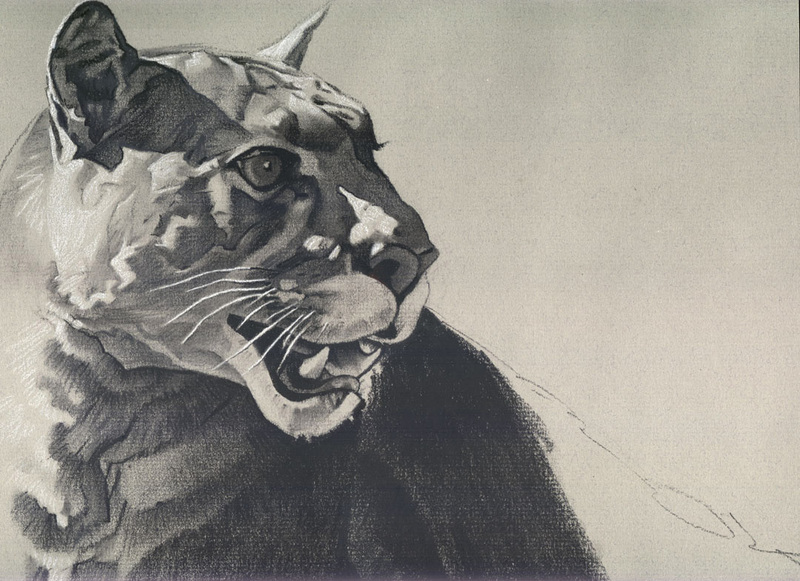 I am working in charcoal here, and this is one of 2 ways I initially approach a DRAWING when using the medium (I will demonstrate the other sometime in the future). Starting in the upper left section, I begin the shading process. I look for the larger, darker areas first. 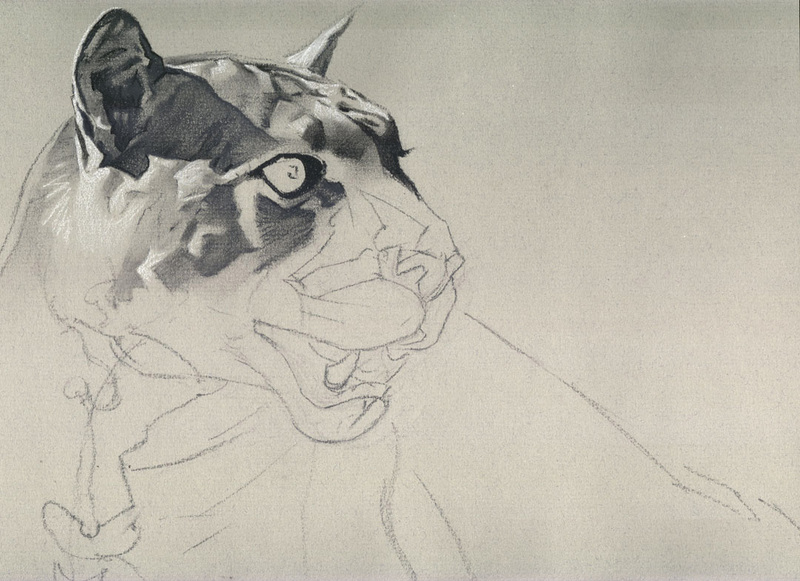 Rubbing my fingers on the paper to smear the charcoal helps to create shaded areas. I (carefully!) sharpen 2 or 3 charcoal sticks with a single edge razor to draw thin fine lines needed. Otherwise a dull stick is used for thick lines and shading while a stick laid horizontal on the paper is also used for shading larger areas. The kneadable eraser is invaluable when working with charcoal, and I use it to create shapes and highlights. Of course the white pastel stick is reserved for the brightest highlights and I try to employ it sparingly. There is roughly 2-3 hours of work represented in each step illustrated. I pay close attention to my reference photo, but take liberties with things like line and contrast. The paper stump tool is basically tightly wound paper in the shape of a pencil with a sharp edge on either side. 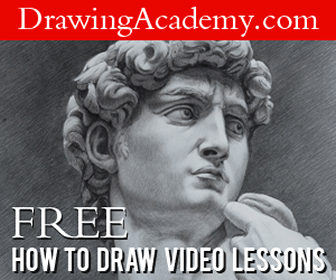 I used it often on this DRAWING as it is very helpful for smoothing and blending small tight areas of the DRAWING and allows for fine detail. If I’m concerned that using my fingers to blend a small area will obliterate the surrounding section I will use this tool. 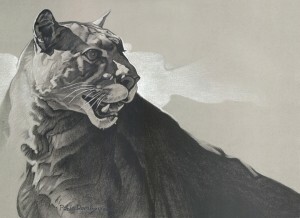 A white shape is introduced in the background, which serves to add contrast against the contour of the cats profile. The shape mimics some of those found in the cat itself. I spoke of taking certain liberties and that includes exaggerating the size and length of the cat’s body (more evident in the final uncropped image below). The finished work, “Puma Portrait”. Specs: 12.5 inch x 16.5 inch, charcoal w/white pastel on 64# Strathmore charcoal paper. 3 coats of Prismacolor final matte fixative have been sprayed on the piece. 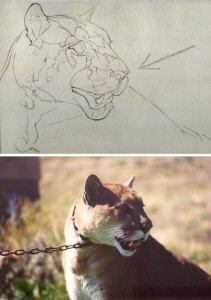 This is great instructions on how to draw a cougar. The detail is amazing. Thanks for the great illustrations. .-= Randy C. Brown´s last blog ..Creating a Sketch on Stretched Canvas =-. I got a look at your gallery on your website. You seem to really know your cougars. Is there a breeding population in Michigan? The ones sighted occasionally here in MO are said to be mostly “rovers”. it was quite straight forward but i eventually got 2 finishing d drawing, thanks!